Volkswagen development chief Ulrich Hackenburg, left, stands with German transport minister Peter Ramsauer and the plug-in electric version of the Golf. Volkswagen AG has revealed a plug-in electric version of the Golf, previewing the zero-emissions driveline and lithium-ion battery technology the company intends to put into a production version of the new car. VW Chairman Martin Winterkorn says the plug-in Golf will go on sale in Germany and other key markets, including North America, in 2013. 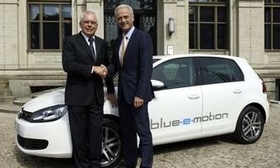 Called the Golf Blue-E-Motion, the car forms part of a broad-based electric-vehicle offensive by VW that will see similar versions of the Mexico-built Jetta and the Chinese-market Lavida also going on sale in 2013. Before they arrive, however, VW plans to kick things off with the introduction of the Up Blue-E-Motion, a car described by Winterkorn as a "city specialist" and previewed in concept form at last year's Frankfurt motor show. Based on the current sixth-generation Golf, the showroom version of the Blue-E-Motion is planned to form part of the seventh-generation Golf lineup that will begin heading into European showrooms in 2013. Mounted in the space normally taken up by the Golf's four-cylinder gasoline or diesel engine is a 115-hp electric motor. It drives the front wheels through a new single-gear gearbox developed by VW and known internally as the MQ210. Electricity for the motor is provided by a lithium-ion battery pack mounted in the middle tunnel of the floorpan, under the rear seat and in the floor of the trunk. With a capacity of 26.5 kilowatt-hours, the battery gives the car a range of 93 miles, VW says. The company isn't providing any recharge specifics just yet, although it has called on the German government to push for renewable energy sources. In a process similar to that introduced on the new Touareg hybrid, the Golf Blue-E-Motion uses a separate clutch that automatically decouples the electric motor on a trailing throttle to provide what Volkswagen describes as a "sailing effect" with little mechanical drag. At 3,406 pounds, the Golf Blue-E-Motion weighs 672 pounds more than the current Golf 1.6 TDI BlueMotion offered in Europe. However, VW hints at reasonable performance with a 0-to-62-mph time of 11.8 seconds and a top speed that, in the interests of retaining battery charge, is limited to 87 mph. VW says it intends to produce a fleet of as many as 500 prototype versions of the Golf Blue-E-Motion for internal testing before the production version arrives in 2013, shortly before the introduction of the Jetta and versions. In a parallel program, VW is also working on a new range of hybrid models. Initiated with the new Touareg hybrid, it will be widened to include a Jetta hybrid in 2012, using the system from the Coupe Concept revealed at this year's Detroit auto show, as well as Golf and Passat hybrids in 2013, Winterkorn said.